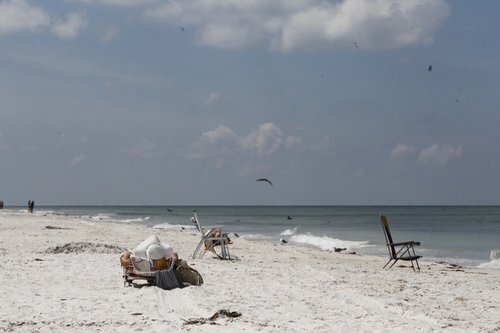 BROOKSVILLE — Hernando County Emergency Management announced mandatory evacuations of all residents in zones A and B on Friday morning, including coastal Hernando County and all mobile homes. Coastal flooding, surge and wind are considered the biggest threats from Hurricane Irma, according to a news release. The county will open shelters at 2 p.m. Friday for those who do not have any other choice. 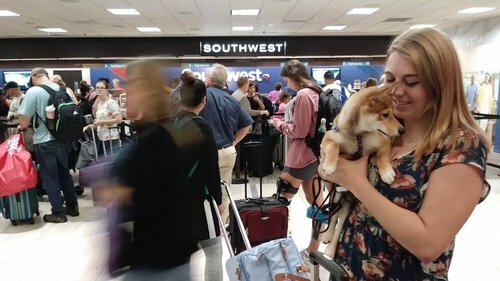 Those include: Hernando High School; Explorer K-8 School; Nature Coast Technical High School; Challenger K-8 School, which is the special needs shelter, and Parrott Middle School, which is the pet-friendly shelter. Patella told the Times that, with the storm track wobbling more toward the west, surge possibilities up to 6 feet are the best-case scenario, as was experienced in Hurricane Hermine last year. People along the coast need time to evacuate, she said, noting that busy roadways and gas shortages will complicate the process. While Hernando County, as of Friday morning, was not under a hurricane watch area, that could change later, officials said. The evacuation order was discussed at an early Friday meeting of the county executive policy group, which includes Patella, County Administrator Len Sossamon, Sheriff Al Nienhuis and superintendent of schools Lori Romano. The public information number for Emergency Management is (352) 754-4083. Meteorology director Jeff Masters at Weather Underground says Hurricane Jose will definitely add insult to the injuries caused by Irma in the Caribbean. 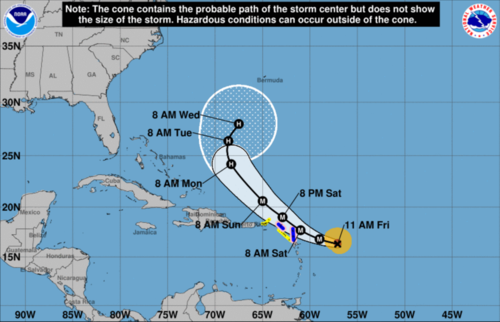 But he says the islands that got nailed — namely Barbuda, St. Martin and Anguila — will mostly suffer tropical storm force winds and heavy rains. That will hamper relief efforts so it's a big deal, but he says it's "nothing compared to what they already went through." Atif Abdelkader, owner of Captain's Pizza on Mandalay Ave stayed open today "to feed the cops" working #ClearwaterBeach !! 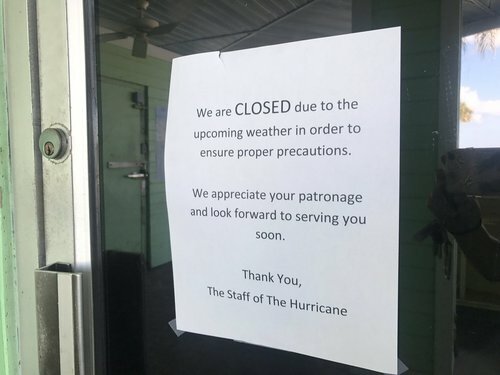 The beachside bar Ka’Tiki on Treasure Island was packed Friday afternoon with mostly locals who seemed unenthused about the looming storm. Bartenders were telling guests that the bar, which has a standalone building and outdoor thatched tiki hut, will stay open for a long as possible. 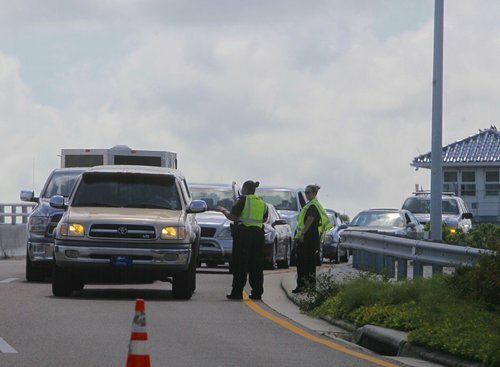 Most of the tourists were gone by Friday, Wille said. He’s just hoping his employees can continue to make it to Treasure Island to keep the bar open. 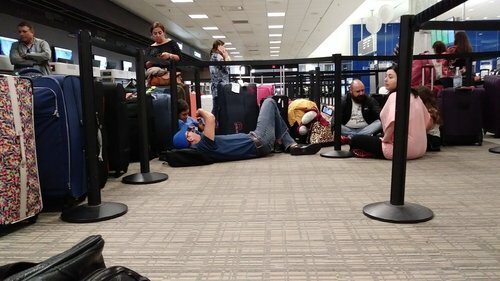 “It’s just us and the locals who refused to leave. We’re kind of like the living room for Sunset Beach,” he explained. 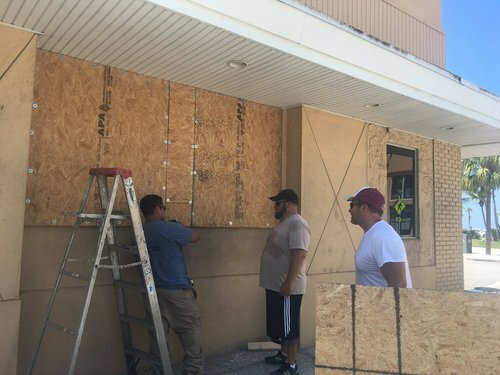 Staff did board up the windows of the bar’s building, but the tiki hut will have to weather the elements without extra support. “We’re praying it makes it through,” Wille said. George Shukis is taking names. He patrols around Harbourside Condos grounds with a clipboard and sturdy Nikon camera, taking note of what’s left on the balconies Friday morning: potted plants, plastic beach chairs, wicker furniture. Shukis, the condo association president, is 66. He kayaks, paddleboards and hits the gym for two hours, five days a week. He’s in better shape than many of the residents in the 108 units in two identical, six-story buildings he oversees on the grimly named Deadman’s Key in South Pasadena. The majority of the residents are seasonal, safe from looming Hurricane Irma in the midwest and Canada. But about 40 percent live year-round in a priority evacuation zone, yet they intend to stay, Shukis says. He won’t leave them, either. Shukis, a retired attorney from Houston, has endured his share of Texas hurricanes. But he worries about the cars on the ground level garage, feet away from Boca Ciega Bay. He frets over the 90-year-old residents who may not be fully prepared for the storm. He said he’s personally collected 100 pounds of ice in his sixth-floor unit to keep their medications fresh. The rest is used to accompany gin. Shukis says he expects high winds and a storm surge. He’s not worried, but he has taped his windows on his sixth-floor unit. Pasco County extended its evacuation order Friday morning, telling all residents west of U.S. 19 and an area north of Fox Hollow Drive and west of Little Road to seek shelter in advance of Hurricane Irma. The mandatory evacuation could affect as many as 120,000 west Pasco residents, officials estimated. The county also mandated evacuations for the occupants of the more than 64,000 mobile and manufactured homes across the county. Kevin Guthrie, assistant county administrator for public safety, said the county extended its earlier voluntary evacuation to a mandated order after the projected path of Irma veered to the west in more recent forecasts. The county also recommended a voluntary evacuation for residents south of Fox Hollow Drive who live west of Little Road, but east of the parallel road that is named, at different points, as Regency Park Boulevard, Rowan Road and Seven Springs Boulevard. Guthrie asked those residents to wait until 6 p.m. Friday before evacuating. Click here for Pasco County Hurricane Evacuation Zone Map and Shelters. All Publix grocery stores in Pinellas, Hillsborough, Pasco, Hernando, Lake, Polk and Manatee counties will close Saturday night at 8 p.m. Stores are tentatively planned to reopen on Tuesday if weather permits. Additionally, Publix stores in Collier, Lee, Charlotte, Sarasota and Desoto counties will close Friday night at 8 p.m. and plan to reopen on Monday. 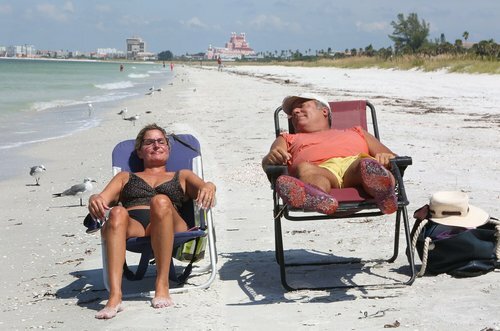 The main arteries of Clearwater Beach were nearly empty of cars Friday afternoon, without the typical bustle of tourists and visitors. 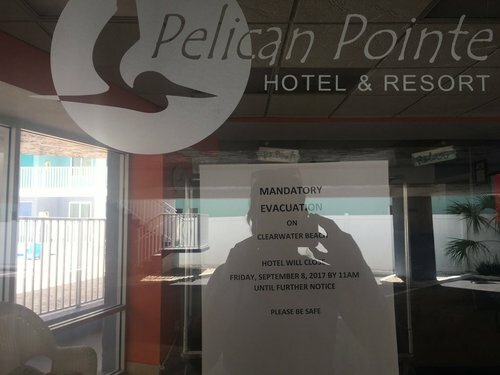 Restaurants and bars locked their doors, some nailed plywood over the windows, expecting no business after officials blocked access to the beach beginning at 10 a.m.
“To feed the cops out here working,” he said. 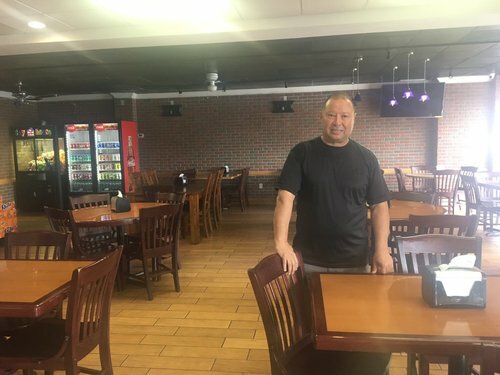 In business for 26 years, Abdelkader said he’s not fearful of Hurricane Irma or what it might do to Tampa Bay. Businesses recover, people protect each other. The shop is typically full of diners by noon, eating pizza, wings, salads. But Friday it was empty. 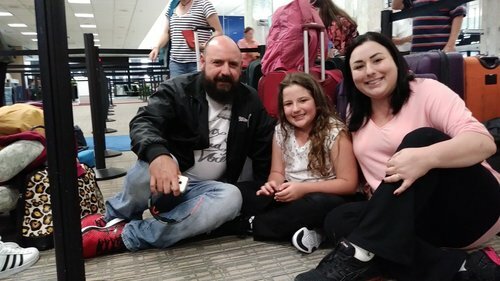 Originally from Egypt, Abdelkader said his Islamic faith has taught him to fast and he is prepared to do so in a worse-case hurricane scenario. He said he will go home to Clearwater after work and tell his wife, mother and one-month-old baby not to worry. The City of Tampa has issued an order for evacuations ahead of the expected high winds across the city and potential storm surge that may occur along the city’s coastal areas. A mandatory evacuation has been ordered for those residents living in evacuation ZONE A effective 2:00 p.m. Friday, September 8. To view evacuation zones by address, use the interactive map here. Hillsborough County shelters are opening throughout today and Saturday. If you decide to stay at a shelter, please bring proper identification, money, and any medicine. For a list of available special needs and other shelters, please see the information given out by Hillsborough County here. The City of Tampa will provide information via social media in addition to the Alert Tampa notification system. Follow the City of Tampa on Twitter @CityofTampa and receive alerts by following @AlertTampa. To receive updated information directly to your phone, text TampaReady to 888-777 or go to Tampagov.net/alerttampa. 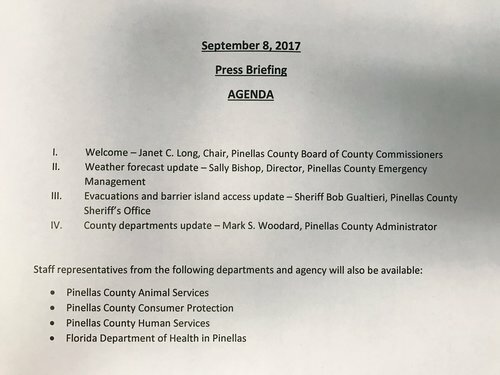 Hours after state Sen. Jack Latvala criticized Pinellas County leaders for issuing a mandatory evacuation orders on Thursday, county commission chair Janet Long and Sheriff Bob Gualtieri stood behind the decision. "It's not a pleasant thing to be on the receiving end of something Sen. Latvala is not happy about," Long said at an 11:30 briefing Friday, adding: "We are very very comfortable with the decision that we made was the right one." "It was a bit affirming" the track turned west later in the day. She respects the senator but said, "On this issue he was just wrong." Gualtieri said the sole focus now should be on protecting residents and the decsions were made for the right reasons. "Make no mistake that everybody standing here... is trying to make what they believe is the correct decision, the best decision in the interest of the citizens, in the interest of public safety. "He added: "We had a small window in which to operate. We are faced with a severe storm...You can't turn the ship on a dime. We can't do that in a couple hours. If they're lot perfect decisions, I can tell you they're made from the heart." In a Times/Herald interview, Latvala suggested that officials were overreacting by ordering mass evacuations of coastal areas -- including in Pinellas County. 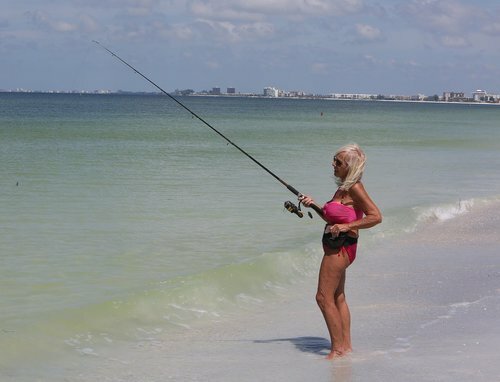 “I have lived in Florida for 50 years. We have hurricane season every year. We try to use good judgment,” Latvala said. ”I’m not sure that we haven’t overdone it a little bit ... Do you have to close down the state four days before the storm gets here?" Like many of his constituents, the Senate budget chairman lives in a flood-prone area. He's following the evacuation order and is headed to Tallahassee. Before leaving, Latvala held a kickoff fund-raiser for his campaign for governor Thursday at Ruth Eckerd Hall in Clearwater--also in an evacuation zone. He noted the event was scheduled weeks ago and that the weather was fine Thursday.